This close up shot of the face of a grizzly bear in Denali National Park in Alaska, USA makes one realize how beautiful these animals are. These dark brown eyes are not ones you want to be staring back in if you encounter a Grizzly Bear in Denali National Park or any other wilderness area. 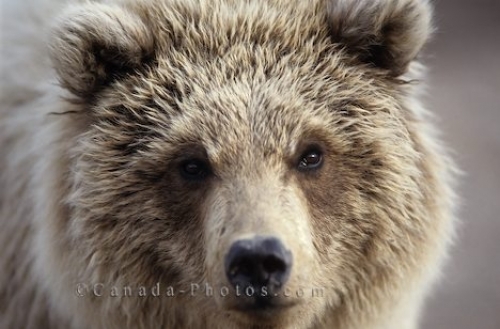 A Grizzly Bear assumes that eye to eye contact is a sign of aggression. Photo of a beautiful face shot of a Grizzly Bear wandering amongst the wilderness in Denali National Park, Alaska.